A place to guide and lead our College Students to a life of Christ that they are able to apply to their daily living. The Wesley supports the students in their growth in Christ through Weekly Worship, Bible Studies, Leadership Opportunities, Retreats, and Missions. We exist to allow College Students to come together in a supportive environment with their peers. The Wesley Foundation is open to all Lamar University students and ALL of our Southeast District college students. Visit the Wesley Foundation on the Web! Like the Wesley Foundation on Facebook! Does your church have any students attending one of the following colleges within the Texas Conference? Before you send your college student back to school in the fall please gather their contact information (cell number, most likely, and college address), what college or university they will be attending, and send it to tcolbert@txcumc.org. Timolin will then make sure the information gets to the correct campus ministry within our Annual Conference. This will help our Campus Minsters to keep in contact with your students while they are away. You can also submit information on the online form. U.M. ARMY stands for United Methodist Action Reach-Out Mission by Youth. It provides Christ-centered, quality youth work camps that serve people in need and promote spiritual growth and leadership development in youth. There are Youth Camps every week during the summer throughout the Conference. SE District will host UM Army as well. For more information, visit http://tx.umarmy.org. The Texas Annual Conference offers college students and local congregations an amazing opportunity through the Center for Clergy Excellence summer College Pastoral Internship Project (CPIP). This 10 week internship provides a chance for college students to experience ‘hands on’ pastoral ministry as they discern a potential call to ministry or church leadership. 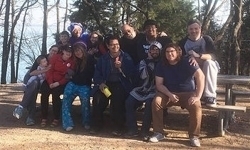 Interns receive a stipend through the TAC as part of the Emerging Leaders Initiative, and are able to connect with other interns at orientation and reflection retreat gatherings. Host churches will agree to provide the interns with housing, mentoring, and a full range of exposure to all facets of pastoral ministry. At the end of each summer, pastoral interns return to college not only with local church experience, but with relationships designed to sustain them throughout lifelong careers. Please click on the link for additional information, including applications for interns and local congregations. Vist www.txcumc.org/internshipproject or contact Michelle Hall, Associate Director, Center for Clergy Excellence, 713-521-9383 (ext.325) for more information.